The Tcherepnin Society Website - Welcome! 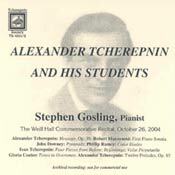 To contributors at the Donor level ($50.00) or higher, The Tcherepnin Society is offering a special gift: a 2-CD package, Alexander Tcherepnin and His Students, in which the extraordinary pianist Stephen Gosling performs the Tcherepnin Society commemorative concert program he gave in New York on October 26, 2004 at Carnegie Hall’s Weill Recital Hall. Mr. Gosling’s renditions here of two major Alexander Tcherepnin scores—Message, Op. 39 and the Twelve Preludes, Op. 85—stand comparison with the finest Tcherepnin recordings ever made, and he brings the same artistry to significant works by Tcherepnin’s students which are presently unavailable to CD listeners: Robert Muczynski’s First Piano Sonata (1955–57), John Downey’s Pyramids (1961), Phillip Ramey’s Color Etudes (1994), Ivan Tcherepnin’s Four Pieces from Before (1961), Beginnings (1964), and Valse Perpetuelle (1977), and Gloria Coates’s Tones in Overtones:Sonata No. 1 (1971–72). Supporting Member contributors will also receive a copy of the printed program from the Weill Hall concert, with detailed program notes and biographical information. Since this is an archival recording, not for broadcast or commercial use, it is available ONLY as a gift from The Tcherepnin Society. The highly diverse, superbly played program, representing a broad spectrum of musical styles, is worth the attention of anyone interested in twentieth-century keyboard literature. DONORS ALSO HAVE THE OPTION OF SUBSTITUTING THE GIFT THAT IS OFFERED BELOW TO SUPPORTER-LEVEL CONTRIBUTORS. 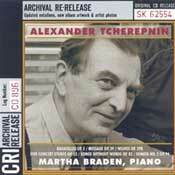 To contributors at the Supporter level ($25), The Tcherepnin Society is offering a gift of a CD of Alexander Tcherepnin piano music, sponsored by The Tcherepnin Society and recorded by pianist Martha Braden under the supervision of the composer’s late widow, Ming Tcherepnin. Beginning with Tcherepnin’s popular Bagatelles, Op. 5 (not otherwise available in CD in its original solo piano form), this special Archival Re-Release on the CRI label ranges over Tcherepnin’s career, including Message, Op. 39, Voeux, Op. 39-b, Five (“Chinese”) Concert Etudes, Op. 52, Songs Without Words, Op. 82 and Sonata No. 2, Op. 94—all adding up to a laudably representative sample of the composer’s extensive keyboard output. Please remember that all contributions to The Tcherepnin Society are tax deductible. We urge you to join us in fostering the music and the transnational aesthetic ideals bequeathed from Nicholas, Alexander and Ivan Tcherepnin to subsequent generations. To bring up and print out the Tcherepnin Society Donation Form, please click here.